Do you have one or several missing teeth? Have you had dentures for years but want something solid and natural looking to chew and smile with? Dental implants may be the solution for you. Tooth implants have been used successfully for many decades, and have proven themselves to be a reliable addition to the treatment options currently available in high-quality dental practice. 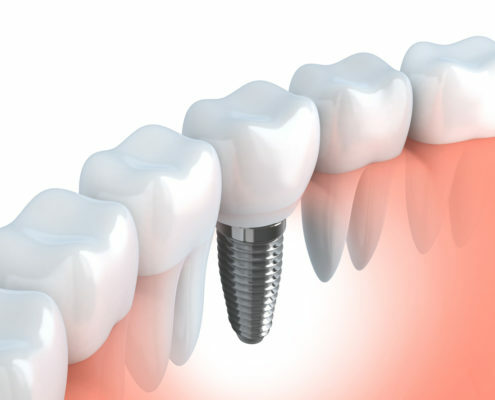 Dental implants are small, pure titanium screws that are surgically placed in your jaw. Following their placement, they are left to heal in place for 3 or more months. During this time, ‘osseointegration’ occurs, which basically means the bone heals around the implant fixtures, locking them into place permanently. Once ‘integrated’, false teeth, crowns, or other appliances may be solidly attached to them, either with screws or cement. If only one tooth is to be replaced, generally a porcelain crown will be attached to a single implant fixture. If a few teeth are missing, likely more that one fixture will be required. Not necessarily one fixture per tooth, however, as 3 or 4 tooth bridge can often be attached to two implants, one at each end of the bridge. If a full arch (all the upper or all the lower teeth missing) is to be restored, several fixtures can be placed, with the denture either screwed to or clipped onto the fixtures. Dental implant treatment can tend to initially be more costly than more conventional treatment options, however as it provides a very long term solution over time the cost is often comparable. Dr. Walsh has over 25 years experience with providing implant based solutions for people of all ages and backgrounds. If you would like to know more please give us a ring, book in for a consultation, or feel free to email us to dentistry@merivale.co.nz with your questions.